This product from Chess Baron: Timeless pieces: The Revelation ll has been three years in the making from Phoenix chess systems in conjunction with DGT in The Netherlands. The result is a luxury suite of first class and world class chess computers - unequalled in quality and playing experience. The cabinet is made from rosewood, the pieces are made from various woods - all solid and with frequency signal identification in place for individual piece recognition. Revelation II unites multiple very strong chess engines resulting in a great diversity in computerized chess play at ELO levels up to 2800 and above. The chess engines run on Revelation II (it doesn't need to be connected to a PC) but optionally can also run on the PC through the wireless Bluetooth UCI Server. New and updated engines will be available from the Revelation website and with upgrade possibilities for additional Flash Storage, stronger (Multi Core) CPU and new software or hardware add-ins. The Revelation is also future proof! 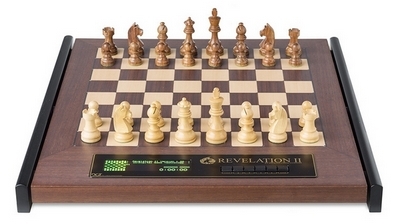 The Revelation ll is the worlds best chess computer.Chess Baron Chess Sets: Because we know you care - we care. Buy Peace of mind - Buy Chess Baron.